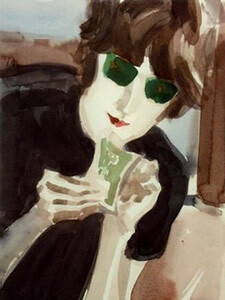 American painter Elizabeth Peyton is renowned for portraits of 'friends' both real and fictional. Figures gleaned from history or popular culture - Oscar Wilde, John Lennon, Abraham Lincoln - intermingle in her work with depictions of actual acquaintances. The artist's use of informal settings, first name titles and a brisk, washy style lend an intimacy to her work that apparently situates it firmly within everyday experience. Yet clearly, many of Peyton's portraits depict nothing but projections and assumptions regarding the figures she evokes. Peyton's strategy highlights a noteable contemporary trend regarding concern with the famous and, in particular, the way in which they are today perceived. Unlike artists such as Warhol, whose mechanised portraits represent the celebrity or historical figure as iconic though essentially remote, today's artists often attempt to assimilate well-known personalities directly into their work. With unprecedented access to a proliferation of information regarding the famous, the general public undoubtedly feels 'closer' to such figures than ever before; yet this very accessibility, combined with collective 'celebrity obsession', implies a level of familiarity that can almost seem personal. With the parameters marking 'real' relationships further blurred by online activities such as social networking, a tendency to merge the virtual with the actual is one that artists such as Peyton are both subject to, and comment upon. 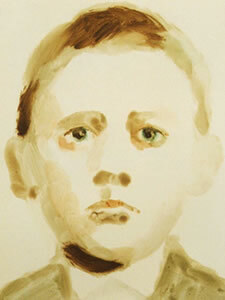 UK artist Annie Kevans also concerns herself with portraying well-known historical or contemporary figures, although in an interesting twist, envisages them as children. In her best-known series, the strategy takes on a chilling resonance as infamous personalities such as Hitler and Stalin depicted as wide-eyed young boys, innocent of the crimes they will later perpetrate. 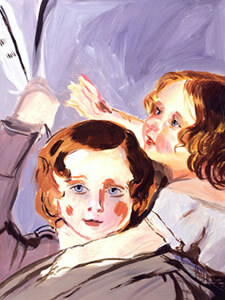 Kevans' subject matter and romanticised, washy style are, of course, highly reminiscent of Peyton's, but her take on the theme of celebrity does at least differ, involving the viewer in an impossible contemplation of famous subjects 'untouched' by the recognition they will later achieve. Karen Kilimnik's body of work combines interests including ballet, history, pop culture, architecture and again, celebrity figures. The diversity of these sources cohere into a documentation of the artist's real and imagined experience, with her paintings just as likely to record actual events as fantastical, fictional scenarios. In similar vein to Cindy Sherman and Gillian Wearing, Kilimnik is apt to present herself as another personality in images ranging from rapidly altered photos to elaborate 'self'-portraits. To complicate matters further, such portraits are often based on existing images of well-known society figures. Yet besides casting herself in various roles, Kiliminik also assigns celebrities completely new personas. 'Marie Antoinette Out For A Walk At Her Petite Hermitage, France, 1750' (2005) clearly depicts heiress Paris Hilton, despite the work's title. In similar vein, actor Leonardo DiCaprio appears in various canvases and drawings as 'Prince Charming', an amalgam of both the fairy-tale and ballet character. While Kilimnik's constant conflation of personalities hints at a personal universe driven by guileless fantasy, her characteristic use of highly descriptive titles implies a far more knowing and critical stance. Her depiction of Paris Hilton as Marie Antoinette, for example, inevitably raises questions regarding the choice of 'alter-ego' for the American heiress. Was the persona of the tragic French queen suggested by a simple play on the word 'Paris', or by historical readings of Marie Antoinette ranging from doomed victim of circumstance to empty-headed, licentious spendthrift? Given Kilimnik's tendency to cast herself in fictional roles, we may well assume that the work represents yet another fantasy 'self-portrait', this time in the guise of a 19th century child. Yet what if the 'I' of the title is meant to represent the young girl shown? In this case, the portrait becomes that of a subject who Kilimnik herself has assembled - or at least appropriated - effectively creating an entirely new being. In fact, the portrait is a loosely rendered copy of an 1849 work by Winterhalter, a favourite painter of Queen Victorian and her consort, Albert. It depicts two of their children, the young princess Helena with her brother Alfred, thus rendering the 'I' of the title even more complex. Who, exactly, is the supposed author of this actual work rendered an enigmatic quasi-fiction? A Victorian princess become painter; or a contemporary painter posing as a Victorian princess?